FANBOY PLANET.com . 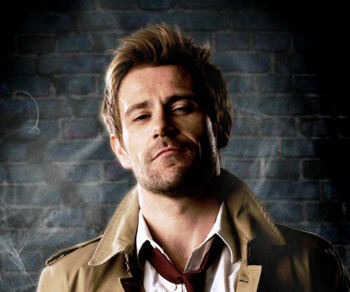 : mc-constantine-trailer :. Run a website like this, and you simply can't take a day off. After announcing that they were committing to Constantine, NBC released a trailer this weekend that show they're hitting all the right notes. Granted, it also looks like they're allowing a little crossover for fans of the film -- there are hints of souls and demons floating around constantly, which John Constantine himself can see. But in all other ways, this is Hellblazer brought to life. NBC even acknowledges it as "...based on the DC Comic Hellblazer." UPDATE: Friday nights at 10 following Grimm at 9 p.m. - that makes for a pretty good genre night.